Do you love fashion? Do you want to enjoy a fun night out? Don’t miss out on the one-of-a-kind, sustainable Redress Fashion Show on Friday, August 19, 2016 at CAM Raleigh. Not only will you get to see elaborate and intricate designs, but you will also get to learn about Redress Raleigh and eco-fashion! Redress is a Raleigh-based nonprofit organization of fashion lovers who nurture independent designers and educate people about the impact of their purchasing decisions. They believe in authenticity and being conscious of their impact on society and the environment. They strive to raise awareness of sustainable solutions throughout the fashion and textile industry and promote designer education. Overall, they aim to make fashion less intimidating – and more engaging. The event highlights designers that put a strong emphasis on responsible design and sustainable production processes. The show allows the designers to display their work in front of leaders in the fashion and textile industries. To learn more about this year’s designers, head over to www.redressraleigh.com/2016-redress-fashion-designers1. To top it off, the event will be held at CAM, Downtown Raleigh’s own Contemporary Art Museum of Raleigh! Be sure to invite your friends and purchase your tickets soon at www.redressraleigh.com/redress-fashion-show-2016/. The event is likely to sell out prior to show day. All tickets are available online. General admission are just $25, reserved front row are $50. 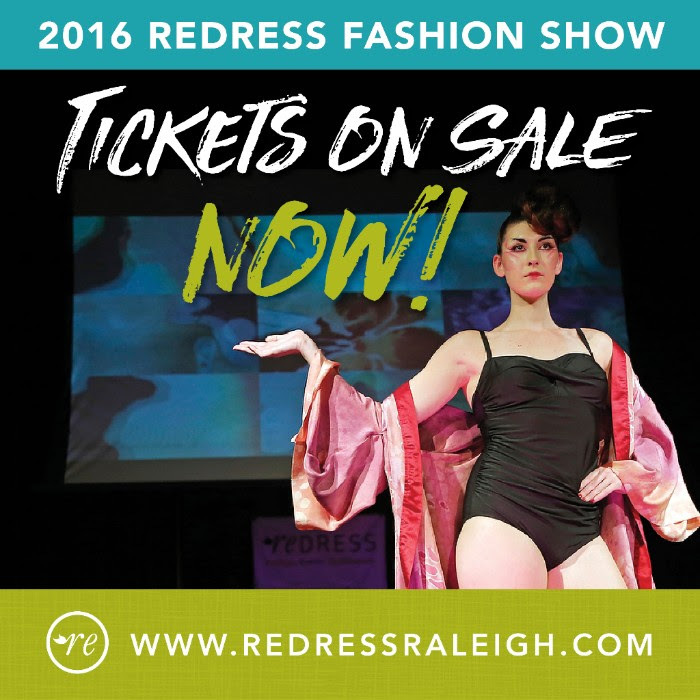 Editors Note: Raleighwood Media Group + Raleighwood Event Group, the publisher of DTRNews.com, is pleased to be joining Redress Raleigh as a sponsor of the 2016 Redress Fashion Show.